Every once in a while, I like to get back to the basics. The basics for me are always about people and how we relate to each other. This post addresses giving and receiving feedback. I know, it is an old topic but I’ll stop talking about it when more of us get better at it. In the meantime, here it is…again. 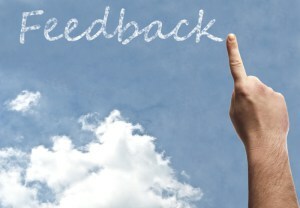 “Feedback is the breakfast of Champions” or so says Ken Blanchard. But I’m wondering how many of us truly have an appetite for it. After all, it has a way of feeling like bad news much of the time. Why is that I wonder? Well, first of all a very common view of feedback is this. Feedback equals Criticism. When I looked up the word criticism, here are some synonyms that greeted me…reprehend, censure, reprobate, condemn, denounce. Okay then, I can’t wait to get me some of that! Often too, the experiences we have around performance management time can bring on an allergic reaction to feedback because, despite good intention, it is often delivered badly and received equally badly…a breakfast of champions complete with sour milk. Perhaps, then, the task for all of us is to shift the perspective of feedback from one that equals criticism to one that equals opportunity. So, where is the opportunity in both providing and receiving feedback? We only see ourselves from the inside out. The value of having others observe us and give us information about what they see helps us ‘round out’ our impression of ourselves. Information about ourselves gives us a chance to make changes that have some personal meaning. The hardest part about making change is the commitment it takes to sustain new behaviour. Knowing why a change is important helps us to remain on course and raises the potential for experiencing positive results from our efforts. Feedback becomes a gift when it is presented sincerely and without judgment. As well, when it is given as part of a conversation rather than a laundry list of things to fix, it is more palatable for the recipient and allows for deeper understanding on both sides. Giving feedback allows us to paint a picture of what we believe another is truly capable of and to shape our expectations around those beliefs. If we simply demand a certain level of performance without inviting input or considering what people might need to make it possible, we will likely be met with resentment rather than interest. This means that if we are going to observe someone going about their work and then provide meaningful and useful information to them, both parties have to be focusing on the same things. Feedback, after all, is comprised not of a single conversation but a series of conversations that lead to change and growth. Sitting down with someone once a year to talk about performance and outcomes does not encourage an opportunity based perspective on feedback. Instead, it becomes something one dreads. Having daily conversations with people and making daily observations about their activities facilitates good and useful exchanges of information. Who is not familiar with this? Its starts with something positive; ends with something positive and then sandwiches the negative you-know-what in between. I personally don’t like this approach because it feels contrived. And, by the way, no one is fooled by it. In my experience, people who say nothing during a session that includes personal feedback can have plenty to say when the session is over, and to people who can only commiserate. While this might feel good at the time, it really isn’t very helpful. Participating in the conversation means asking questions. It sometimes means disagreeing and challenging. But it also means there is opportunity to understand as well as to be understood. That alone has great value. To be open to receiving feedback I think we must also do our best to wipe out the negative “tapes” that play between our ears about it. In short, an open mind helps. I wrote this post in September, 2011. It was inspired by the a story of a woman’s grief and the choices her employer made to deal with its impact on their workforce. There are lessons here worth repeating. I was thinking the other day about how easy it is, when first embarking on the leadership road to pack our authority and our sense of self-importance but leave little room in the bag for what it really takes to lead well ~ heart. For the fledgling leader it’s an easy mistake to make. As fledglings, we often expect little from others, except maybe obedience. I like to think that most of us grow out of it. Some people though, fledgling and seasoned alike, treat the leadership role like a game of monopoly. They have a strategy and goals. They deal in only that which they can hold in their hand or see on the bottom line. They buy and sell, trade and bargain. They strive to pass GO as often as possible so they can collect their $200 regularly. Their focus is singular, their intent only to finish the game with the greatest number of assets. It is possible that these leaders believe their legacy will come from asset gathering alone. There are after all, some very wealthy and powerful people who have amassed their fortunes in just that way. So why bother to mess it up with emotion? Well, simply put, human beings are emotional creatures. And, if we expect them to bring all of themselves to work and dedicate their energies to the success of our enterprises, we must also care about them. Witness the case of Cecelia Ingraham. Ms Ingraham worked as an Administrative Assistant for a pharmaceutical company in New Jersey. She is also a mother whose teenaged daughter died. That kind of grief is unimaginable for most of us. Her co-workers, although initially sympathetic, became uncomfortable around her because she talked about her daughter constantly, hung the girl’s ballet shoes in her cubicle and displayed her child’s photograph on her desk. Someone complained to the boss that Ms Ingraham’s behaviour was becoming disruptive, interfering with the work. The story goes down hill from here, the bottom line of which is this. Ms Ingraham was told to remove the mementos of her daughter from her workstation; stop talking about her and, in fact, pretend that she had never existed. There is more to this story, the outcome of which produced no winners at all. Money was no doubt spent in both accusing and defending. The twelve years of experience and the time Ms Ingraham spent learning and contributing to the company prior to her daughter’s death were lost. And there are others costs. Those who continue to work for this company will by now get the message that perhaps its best to leave part of themselves in a safe place at home. There is, after all no empathy waiting for them at work and no help when they really need it. As Glenn Holland put it in Mr. Holland’s Opus, “Music is not just notes on a page”. Similarly leadership is not just about being in charge or numbers on a balance sheet. So, if you are new leader by all means pack your self-confidence; be aware of, and use your authority but please leave plenty of room for your heart. If you are to be truly successful, you will need it. And so will everyone else. This post, from January 2012, challenges the 360 degree feedback process first popularized in the 1990s. Too often, rather than use such a process as a springboard to having important conversations, we make the process itself the focal point thus diminishing its usefulness. I’m not a big fan of surveys. That includes, (dare I say it? ), the 360 degree performance assessment type survey. I know, they are meant to be a useful tool but to me, no matter how carefully put together they are, the result is rather like a distorted mirror in the Fun House, not very clear and not particularly accurate. The trouble is, there are often a number of factors at play that skew the results one way or another. Here are only a few examples of what I mean. When Bob’s boss asks him to complete a survey at a time when Bob is not best pleased with him, his objectivity flies out of the window and his responses are coloured by the way he’s feeling at that moment in time. Bob would like his colleagues to complete their survey about him favourably so he completes their surveys favourably too. It’s kind of a quid pro quo thing. You know? The questions all ask Bob to respond by choosing from a range of ratings from poor to outstanding. While he has a pretty good idea what each rating means to him, he has no idea what they mean to others and what standards they work from when they complete the survey. Even though there may be room for Bob to explain his ratings, usually he doesn’t, because frankly he doesn’t have time. He still has more surveys to complete for several more of his colleagues. So he just ticks the boxes and hopes that will be enough to satisfy the process. So, while I agree that “good information helps Bob make better decisions”, the information gathered from a formal 360 process runs risk of being inaccurate and therefore, not really that useful. The question is, what is Bob to do? How will he find out how he’s doing if there is no formal process to tell him? How he talks to people and how he listens ~ If the communication between Bob and his Boss; Bob and his colleagues and; Bob and his team is honest, clear and empathetic, there will be enough trust among them for him to simply ask how he’s doing without having to go through a formal and anonymous process. How he builds relationships ~ in my mind, the health of any business relies on its ability to build relationships. This requires people like Bob to work well with those around him; to understand their challenges; help them; and solicit their help too. Building relationships ensures that the quid pro quo among colleagues has meaning that goes beyond the notion of “I’ll tick your’ like’ box if you’ll tick mine”. How much he cares about helping others to learn and grow ~ In my book, people who spend time coaching and providing learning opportunities so that others can be and do better usually know when they are doing well. For them, great performance comes from their ability to help others deliver great performance too. If Bob were to do this, he would have no need of a formal feedback structure. He would be giving it and getting it. Every day. So okay, maybe I’m being a bit Utopian. I know there are still many organizations that struggle with all three of these things. It is not an ideal world. I’d like to think though that rather than relying on complicated and expensive 360-degree performance processes to guide them, more workplaces will spend their time talking, listening and simply building relationships well enough to make them unnecessary. “Feedback is the breakfast of Champions” or so says Ken Blanchard.But I’m wondering how many of us truly have an appetite for it. After all, it has a way of feeling like bad news much of the time. This is a refreshed version of a post I wrote a few years ago. I’m presenting it again because I believe coaching is a major part of a good leader’s life. Done well, it can create amazing results, enthusiasm for work and optimal achievement. Done badly, it can demotivate even the most confident of people and undermine the most honest of efforts too. In other words: Coaching is a big deal….and it’s not for sissies. Coaching is one of those words that tends to lace everyday language at work. I wonder though, how many people who are supposed to be doing it, actually know what it means or what it takes to do it properly? Well, I don’t really know the answer to that question but here’s what it means to me. Sometimes, I won’t be able to see myself as you see me. Sometimes I will not want to stretch myself for fear that I might fail. As my coach, you will challenge me to go beyond the unspoken boundaries I have set for myself. You will not accept my excuses. You will show your faith in my abilities and my potential to do more by demanding more. And, should I fail, you will help me to extract the learning from it and move on. When a new idea captures my imagination, it is easy for me to envision bringing it into reality. And yet, while I will understand the importance of it, there will be times when I need your help to stay the course. Starting is usually easy. Finishing is harder. As my coach I will rely on you to remind me of the importance of completing what I set out to do. And, if I shift my focus, you will help me ensure that my reasons are valid. There will be times when I question my own abilities; when I need guidance and resources to help me do my work and: when I need acknowledgement for the work I have already done. As my coach, I will count on you to deliver these things at the times when they are most appropriate. That will require you to talk with me regularly. Our talks do not have to be long but they must be truthful. The success of our relationship will depend on it. Self Assurance – If you are to be successful in your coaching efforts, you will often have to suspend your own desire for acknowledgement and work in service of helping someone else shine. This can be hard on the ego and as such, a healthy sense of self, both in terms of assurance and awareness, will be important. Self Discipline – As much as it is important for those you coach to follow through on their commitments, it is as, if not more, important for you, as coach to hold yourself accountable for the commitments you make to them. Courage – Coaching often requires difficult conversations. Courage is a cornerstone of good coaching and of good leadership. For a good coach or leader there is usually no place to hide. A sense of humour – Most good coaches know the value of humour, particularly the self-deprecating kind. It is an essential tool at work and in life. When those whom you coach, do well, you do well. When you coach others to do their best work, chances are, you’ll get optimal results for your organization. Good coaches are often recognized as having valuable leadership capability. And that opens doors for you. The reality is, there is no magic formula that will transform us into good coaches. Like most things, it takes work. I happen to think it is very worthwhile work too. P.S. In case you’re curious, here’s a clip about coaching that demonstrates how NOT to do it. Ever been on the receiving end of some of this?